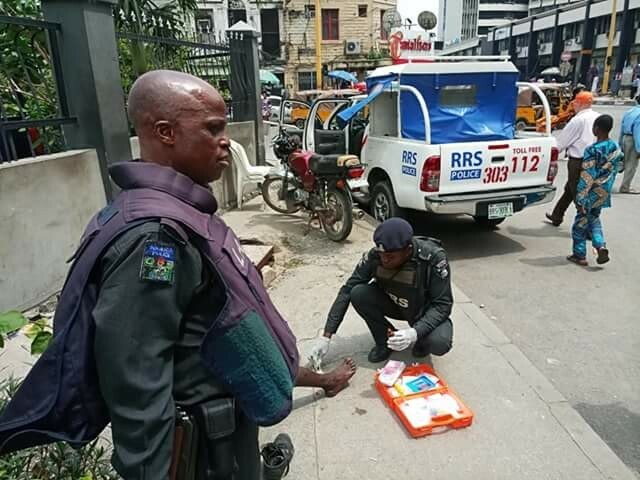 Nigerian Police officer spotted giving first aid to accident victim ~ Nigerian news platform bringing you News in Entertainment, Politics, Sports & Lifestyle. "For those of us who have lost hope (and faith?) In the Nigerian Police Force and think nothing good can ever come out of them, I have a very pleasant surprise for you. I was minding my business somewhere around CMS Bus Stop on Lagos Island this afternoon and witnessed an incident I just had to capture on camera and share here. Apparently, there had been a minor accident minutes before between two commercial cycles...a Tricycle (Keke NAPEP) and a Motorcycle (OKADA). Lo and behold, the Mobile Policemen on duty nearby rushed to the scene, not to demand for bribe, but to give First Aid treatment to a victim of the accident....complete with their own First Aid Kit!